You would never know it but San Diego has a huge Japanese community and as a result there are some great Japanese eateries there. I've had amazing sushi, yakitori and ramen there, among other delicious things. One of my favorite places to go was Yakitori Yakyudori. 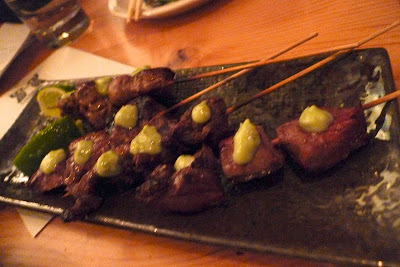 Yakitori means "grilled bird" in Japanese and it refers to skewers of meat that they barbeque over a charcoal grill. The selection of meats, ranging from chicken hearts to squid tentacles, is endless. 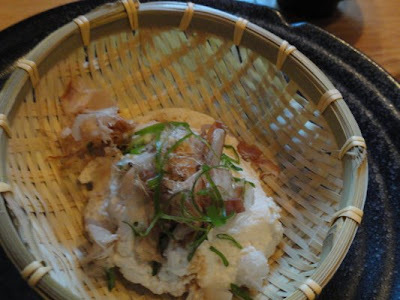 Izakaya's are Japanese drinking establishments or pubs that sell small plates or snacks to accompany the beers and sake. Ever since I moved to Chicago, I've been on the look out for one here, but there haven't been any contenders, until now. 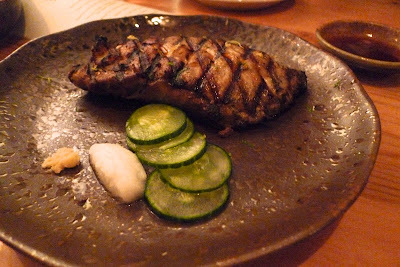 It's the brain child of chef-owner Harold Jurado of Sunda, Japonais and Trotter's-fame and chef de cuisine Robert Rubba, a L2O vet. Aside from their selection of yakitori ranging from skewered fatty chicken skins to white turnips, they also provide small plates of deep-fried pig ears, reminiscent of pork rinds, baskets of home made tofu, and beef liver sashimi. I had heard of Chizakaya's opening a few months ago and what started out as a dinner with four friends turned into a group of 14. Words travels fast I guess when yakitori is involved. One of the perks of bringing such a big group to dinner is that we got to sit in one of two communal tables in the back room that faced the open kitchen. 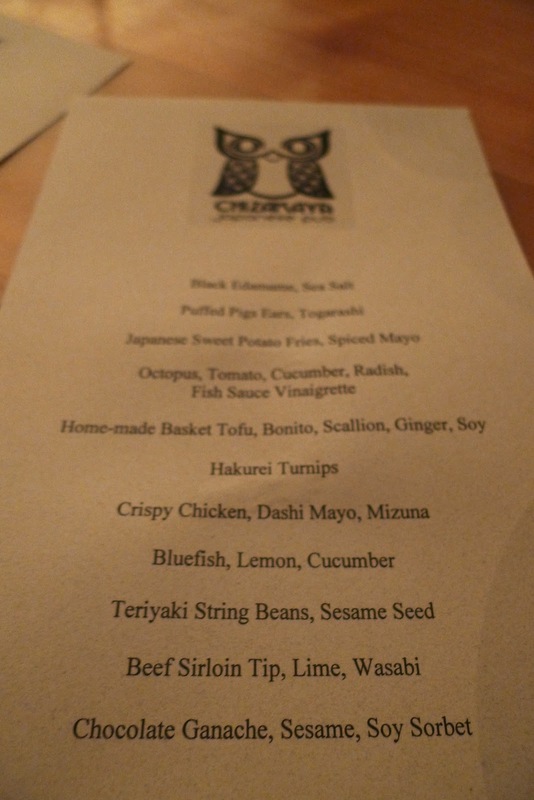 I forgot to take pictures in the beginning but we started out with black edamame with sea salt. 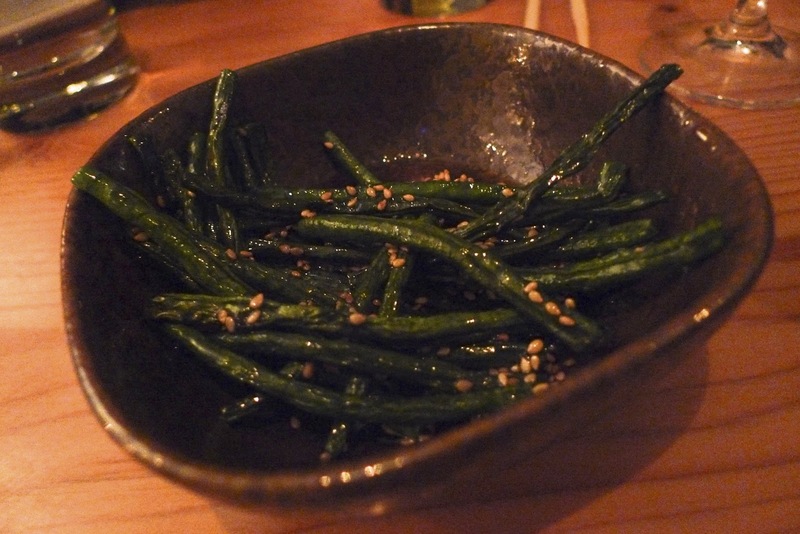 Contrary to what we were expecting, we thought we'd see black soybeans, but turns out they are green when edible, but when they mature, they turn black. So nothing all that exciting there, it looked and tasted like regular edamame to me. 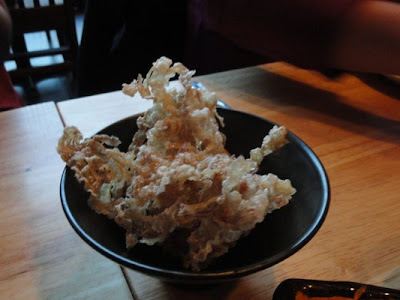 Next we had puffed pork ears with togarashi. It's a must eat! I think it was so much better than Publican's pork rinds. 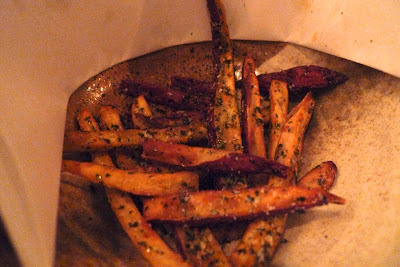 It was far less greasy and much more flavorful. 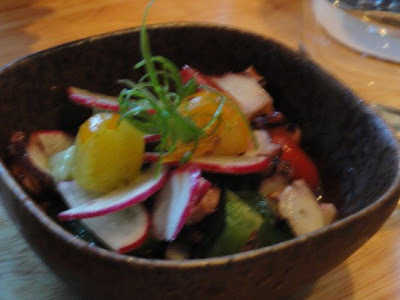 Next we had the octopus, tomato, cucumber, radish with fish sauce vinaigrette. This was tasty but nothing too out of the ordinary. Next, we tried some home-made basket tofu with bonito, scallion, ginger and soy. I'm a fan of home-made tofu. Whenever I see it on a menu, I have to order it. I even asked my friend Pete if she could buy me a tofu mold in Tokyo, but she said it was really hard to find. I guess it's pretty antiquated these days to make your own tofu. 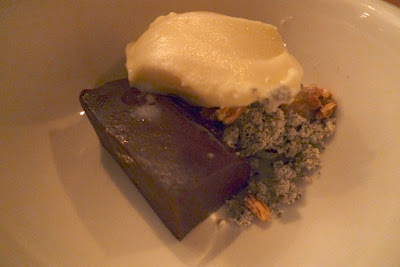 This was like a cloud of creamy, deliciousness. 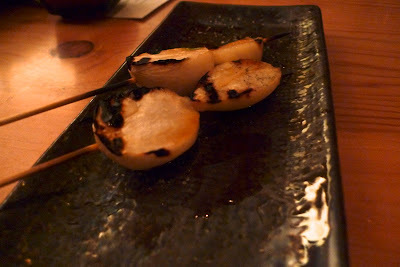 Next we got skewers of grilled turnips. How good could grilled turnips be you ask? Pretty darn fantastic. These were such a surprise, because it looks so unassuming, but they were so good. Hakurei Turnips - order them. Teriyaki green beans. I say skip it, there's far too many other interesting things to try. Bluefish lemon and cucumber. This came later in the course of the meal and I think we were getting full at this point so we didn't devour it like we did with the others. It was grilled perfectly and the crispy skin was the best part. I have to give much love and props to Emily, the restaurant manager. 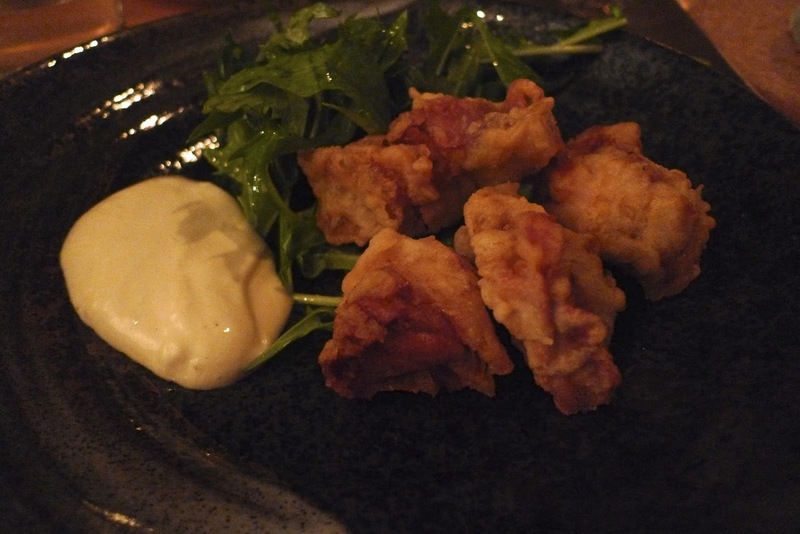 We ordered off of the set menu since there were so many of us and I was really debating about choosing chicken liver as an option because I wasn't quite sure how adventurous everyone would be. Emily told me it was one of their popular dishes and I really wanted to try it, but in the end, I played it safe and picked a more traditional dish to accommodate everyone. Emily was so nice though and sent over a complimentary order of the chicken liver just so I could try it. 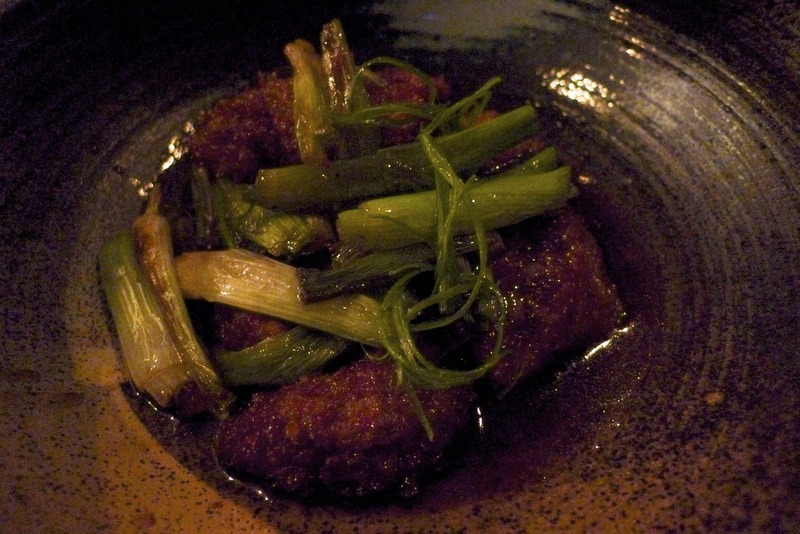 This was the chicken liver and negi or green onions. I actually ended passing this around to the whole group and most everyone tried a piece. haha. So maybe I underestimated everyone's tolerance. I really enjoyed it. I think instead of the chicken liver, I picked crispy chicken thighs with dashi mayo and mustard greens for the group. Again not an "exciting" or "exotic" dish, but executed really well and super tasty. 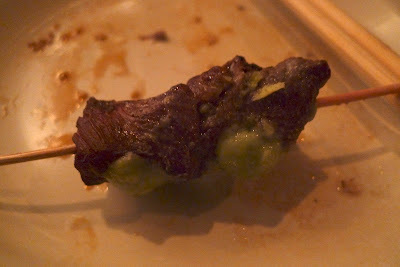 For our next yakitori, we got the beef sirloin tip with lime and wasabi. Note to self, take some wasabi off before you put the whole thing in your mouth. It has quite the heat, but it was so good! Another must eat. Here's a close up. It's so simple, but what a great combination! For dessert, we each got a bowl of chocolate ganache, soy sorbet and sesame. Heavenly! Everyone devoured this. Such a great combination of unlikely flavors. 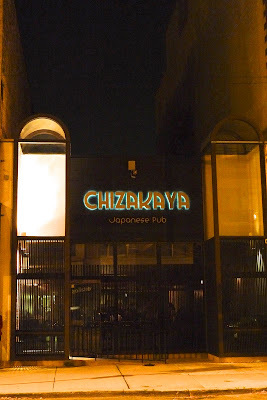 We had a great meal there and I look forward to going back soon. I wish I had been able to try the ramen, but I was bursting at the seams by the end. I just found out that on Thursdays, from 9pm to 12:30 am they have $2 yakitoris and sake. Not sure if the sake is $2, but I must go find out!